Heat oven to 350°F. Grease bottom only of 13x9-inch pan. In large bowl, combine all brownie ingredients; beat 50 strokes with spoon. Spread in greased pan. Bake at 350°F. for 30 to 35 minutes. or until toothpick inserted 2 inches from side of pan comes out clean. Transfer to cooling rack. Cool 45 minutes or until completely cooled. Beat 1/2 cup butter in small bowl until light and fluffy. Beat in all remaining frosting ingredients, adding enough milk for desired spreading consistency. Spread over cooled brownies. Place glaze ingredients in small microwave-safe bowl. Microwave on HIGH for 30 seconds; stir until melted and smooth. 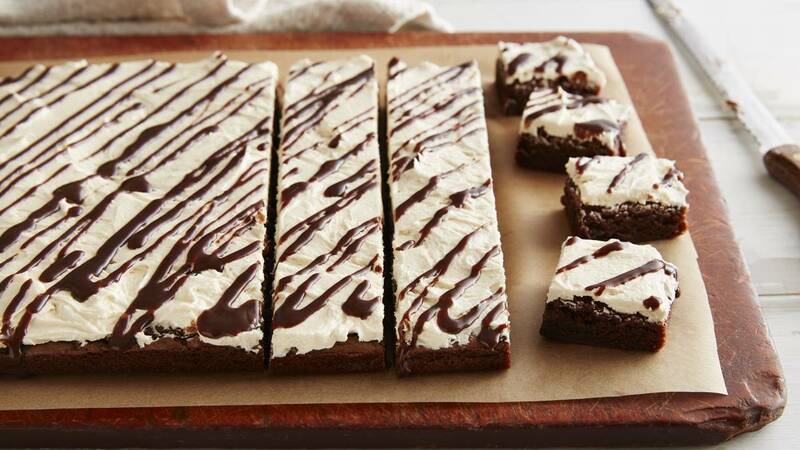 Drizzle over frosted brownies. Refrigerate 30 minutes or until firm. Cut into bars.